Hanshi Hoshiyama Sensei began his martial arts training in the Hoshiyama family Jujitsu system passed down from his father Kazuo Hoshiyama who in turn learned from his father Iwamatsu Hoshiyama who received the Shogo title of Hanshi and rank of 10th Dan from the pre-war Dai Nippon Butokukai. The Hoshiyama family comes from a long family line of Martial Artists. Shihan Hoshiyama’s Grandfathers side is of Samurai bloodline from the mainland of Japan. The Hoshiyama Jujitsu has been passed down from this line. His Grandmother is Okinawan and moved to the mainland in the early 1900’s. With this there was a name change due to discrimination against those of Okinawan blood to a Japanese one. Hoshiyama Sensei is of a distant blood relation to the very famous Karate family of Okinawa the Shimabukuro’s which was headed by Tatsuo Shimabukuro Sensei the founder of Isshin-Ryu and Eizo Shimabukuro Sensei the founder of the Shobayashi-Ryu branch of Shorin-Ryu. While Hoshiyama Shihan was learning Jujitsu, he began training in 1976 under Rudy Crosswell, Hanshi in the Shito-ryu style of karate and continued in that discipline for several years. Shihan’s Jujitsu training continued throughout his life until his father passed away in February of 1996. Karate had always appealed to Hoshiyama Sensei because of its dynamic and often flashy striking movements and its beautiful kata. At a Karate tournament Shihan had the opportunity to meet a man who was known as the Father of Karate in America, Robert Trias, Hanshi. Mr. Trias was the head of the United States Karate Association and responsible for opening the very first Karate school in the United States. It opened in 1946 in Phoenix, Arizona. Shihan trained with Mr. Trias at the U.S.K.A. International Headquarters in Phoenix Arizona, learning the Shuri-ryu and Shorei-ryu systems of karate. Sensei Trias also held Shihan rank in Kodokan Judo. He was lucky enough to have had this passed down to him as well. Sensei Trias passed away in 1989 of cancer. During the time at the Trias dojo Hoshiyama Sensei had the opportunity to meet and train under some of the best martial artists in the United States and the world, One of the most notable being Shihan Roy Osborne. Sensei Osborne was the first person to open Hoshiyama Sensei’s eyes to the true ways of Okinawan karate and the old style of very devastating bunkai. Osborne Sensei’s list of teachers is amazing to say the least. Having been a direct student of Hohan Soken, Kanei Uechi, Fusei Kisei, Seiru Oyata, and many Japanese and American masters. Hoshiyama and Osborne have maintained their friendship to this day. Hoshiyama Sensei was taken under the wing of John Pachivas, Hanshi. Mr. Pachivas acted as an advisor and friend to Shihan. He passed away in 2000. In 1989 after Trias Sensei passed and at his suggestion Mr. Hoshiyama decided it was time to learn the original methods of Non-Sport Okinawan Karate. He searched for an authentic Okinawan teacher in his geographic area. He found Shojiro Shiroma, Hanshi a direct student of Shugoro Nakazato, Hanshi. Hoshiyama Sensei trained with Mr. Shiroma for several years. In his efforts to return to the roots of true Okinawan Karate he sought out membership in the Shorin-ryu Shorinkan Kyokai. This is the organization headed by Hanshi Nakazato dedicated to Shorin-Ryu(Kobayashi-ryu) Karate. Hoshiyama Sensei held the rank of Renshi Rokudan directly under Nakazato Sensei. 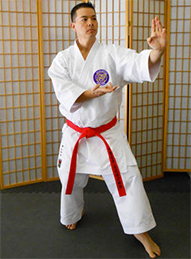 Shihan Hoshiyama left the Shorinkan Kyokai in 2005. 1999 became a very good year as by chance Hoshiyama Sensei met Hanshi Takaya Yabiku 10th Dan a direct student of Hohan Soken-Matsumura Seito Shorin-ryu, Kafu Kojo, Shigeru Kojo and Seiji Irimaji 10th Dan of Kojo-ryu, Seiko Itokazu-Ueichi-ryu, Saburo Kochinda-Yamanni-ryu Bojutsu, Kana Kinjo-Okinawa Hakutsuru and Takeo Mekaru of Matayoshi ryu. Hoshiyama Shihan learned the true private Kojo-Ryu family system as well as studying the Yamanni-Ryu Bojitsu Of Kochinda Sensei, directly from Yabiku Sensei which continued for 15 years until 2014. In 2005 he became a member of the Shorin-Ryu Reihokan Karate and Kobudo Association headquartered in Naha City, Okinawa, Japan after leaving the Shorinkan Kyokai. This was to maintain his Okinawa ties to Chibana-Ha Shorin-Ryu. He was a Senior Representative for the Reihokan in North America and a direct senior student of Hanshi Naonobu Ahagon. Hanshi Ahagon is the head of The Shorin-Ryu Reihokan Karate-do and Kobudo Association from Okinawa, Japan. Hoshiyama Sensei has since resigned from the Reihokan Kyokai. During a month long trip to Okinawa in March 2013, Shihan Hoshiyama after many visits with Yabiku Sensei with the blessings of Seiji Irimaji Sensei and the Koshiro (Kojo) family was asked to spread the art of Koshiro-ryu/Kojo-ryu before it becomes lost to time. Hoshiyama Sensei is the highest ranking person to be ever be promoted in Kojo-Ryu who has resided outside of Japan. On the suggestion of his teachers in April 2013 the Shorin-Ryu Koshinkan Karate and Kobudo Association was formed. This association preserves the historic karate of the Kojo family and teaches separately Chibana-Ha Shorin-ryu. The Kobudo taught is the Kobudo of Shugoro Nakazato Sensei. There are separate structures for all three and the Kihon is maintained as well. Given by Charlie P. Contreras and ratified by the Kondo No Sho Kai. and promoted on the US mainland.